Although we focus on business litigation and insurance coverage, that’s not all we do. We believe that a good law firm should be able to handle a diverse range of cases, and we have the knowledge and experience to give clients the “full service” they may be looking for. Click on the area of practice below to find out more about what we do. When you have a criminal issue, your liberty is often at stake. You need an attorney that knows the system and has criminal experience. Mr. Davis clerked for federal judge, worked at a county prosecutor’s office, and also worked at a highly-regarded criminal law firm in Jacksonville for several years. In all of those positions, he handled hundreds of criminal claims. Family law issues can be some of the most emotionally and physically taxing times in your life. When family law issues arise, you need an attorney to represent your interests. We can help you get through whatever type of legal family situation that you’re experiencing. 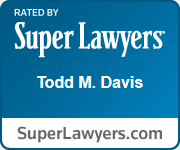 Todd Davis graduated from a law school with one of the only Sports Law programs in the country. There he learned about a multitude of different issues that arise in sports, including contract negotiations, contract disputes, professional sports arbitration, team liability to fans, just to name a few. Over 55% of adults in the United States die without a will. If, like most people, your goal in working is to accumulate more wealth during your lifetime, doesn't it make sense to have control over that wealth (or debt) when you die? Mr. Davis has helped many clients draft a will and plan their estate, and is a member of the Florida Bar’s Real Property, Probate, and Trust Law Section.